1317a, CENTER CAP COPY, 83-94, CHEV, BLAZER, S10/JIMMY, S-10, S15, SONOMA. BLACK PLASTIC, RED GMC, 5 FAKE LUG NUTS. 6" DIA. 1447b, CENTER CAP USED, 85-95, GMC, SAFARI. STEEL RALLY, BLACK PLASTIC, 5 LUG NUT HOLES. POLISHED CENTER, RED GMC. 7" DIA. 1447b, CENTER CAP USED, 85-95, GMC, SAFARI. STEEL RALLY, BLACK PLASTIC WITH 5 LUG NUT HOLES AND POLISHED CENTER WITH RED GMC. 7" DIA. FOR A 15", RIM. 1533a, CENTER CAP USED, 87-91 CHEVY, BERETTA, BLACK PLASTIC, 5 LUG NUT HOLES, BERETTA IN RED CENTER. 5-1/2" DIA. 1677e, CENTER CAP USED, 89-92, FORD, THUNDERBIRD, BLACK PLASTIC CAP, ETCHED SILVER BIRD LOGO, PUSH IN. 6-7/8" DIA. 1682a, CENTER CAP USED, 89 -'92, FORD THUNDERBIRD, MIRROR GLOSS BLACK PLASTIC, ETCHED T-BIRD LOGO, PUSH ON, 7-3/4" DIA. 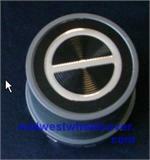 3026b-F, CENTER CAP USED, 92-96, FORD, F150, BRONCO, BLACK PLASTIC, 5 LUG HOLES, SCREW ON TYPE. OPEN CAP, 3-1/2". 3" HUB & 7" DIA. FRONT ONLY. 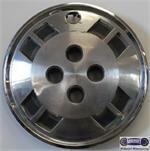 3026b-F, CENTER CAP USED, 15", 92-96, FORD, F150, BRONCO, BLACK PLASTIC, 5 LUG HOLES, SCREW ON TYPE. OPEN CAP 3-1/2". 3" HUB & 7" DIA. FRONT ONLY. 3340F, FRONT CENTER CAP USED, 16", 99-05, FORD, F-250, F-350, EXCURSION, BLACK PLASTIC CAP, 8 FAKE LUG NUT CAPS, OPEN CENTER, 4 METAL CLIPS, 8-1/2"
3340R, REAR CENTER CAP USED, 16", 99-05, FORD, F-250 SD, F-350 SD, SRW, EXCURSION, BLACK PLASTIC CAP, 8 FAKE LUG CAPS, ETCHED FORD LOGO, 8-1/2" DIA. 5028a, CENTER CAP USED, 94-97, CHEVY, BLAZER, S-10, JIMMY, S-15, SONOMA, BLACK PLASTIC WITH GOLD OUTLINED CHEVY BOWTIE, 5 LUG NUT HOLES, GEAR SHAPED EDGE. HELD ON WITH PLASTIC LUG CAPS. ALSO COMES IN A GMC LOGO. FOR A 15" ALUM RIM. 5075, Hubcap center used, 82-83, PONTIAC, FIREBIRD, BLACK PLASTIC CAP, BLACK & GREY PRISM, RED LOGO, 6-1/8" DIA. 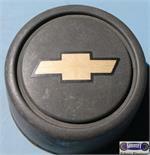 5187, CENTER CAP USED, 04-05, CHEVY, IMPALA, MONTE CARLO, BLACK PLASTIC CAP, RED OUTLINED BOWTIE, PLASTIC CLIPS, 2-5/8" DIA. 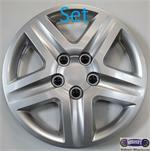 FOR A 17", RIM. 59672b, CENTER CAP USED, 88-92, JAGUAR, XJ6, BLACK PLASTIC, GOLD JAGUAR EMBLEM, RAISED LIP OUTER EDGE. PLASTIC CLIPS 2-1/4" DIA. 60165b, CENTER CAP USED, 93-02, GEO, PRIZM, BLACK CAP WITH CHEVY BOWTIE IN CENTER, 4 LUG NUT CUT OUT WITH 4 PLASTIC CLIPS. 3-1/2" DIA. 60165b, CENTER CAP USED, 93-02, GEO, PRIZM, BLACK CAP WITH BOWTIE OUTLINED IN SILVER IN CENTER, 4 CUT OUT FOR LUG NUTS, WITH 4 PLASTIC CLIPS. 3-1/2" DIA. FOR A 14", RIM.